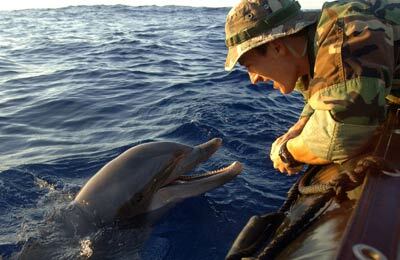 The U.S. Navy trains dolphins to use their powerful echolocation abilities to find underwater sea mines. Dolphins can detect mines tethered to the ocean bottom, sitting on it or even buried in sediment. And, particularly in murky or dark water, their biosonar is more powerful and accurate than any mechanical location device. From the earliest days of using horses for transportation to the more recent use of rats in sniffing out not only land mines but also tuberculosis (see sidebar), humans have long relied on animals’ unique abilities to make our lives more efficient. Dogs guide the blind, hear for the deaf and, as recent studies indicate, can be trained to smell breast and lung cancer on the breath of patients. Like the hero rats, dogs are also adept at detecting land mines and work extensively in places like Afghanistan, Bosnia, Mozambique, Nicaragua and Angola to clear hazardous areas. But they are expensive to train and run the risk of setting off the mines because of their size. So scientists continue to tap into the natural world to find even better ways to detect land mines. Much like dogs and rats, honeybees possess an extremely sensitive sense of smell and can be trained using traditional conditioning methods. 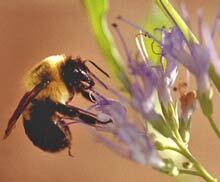 If explosives are placed near the bees’ sugar-water feeder, they begin to associate the odor with the food source. Set them loose on a contaminated minefield and, in theory, they will swarm the areas where explosive residue is present. (Bees have yet to work on live mine fields.) In practice tests, though, the bees exhibited a 98 percent success rate. "The beauty of this approach is that bees are indigenous to every climate on Earth, and there are beekeepers everywhere," Susan Bender, one of the testers from Sandia National Laboratories in Albuquerque, N.M., told National Geographic News online. A hive of 40,000 to 65,000 bees can be trained in as little as two hours. And if, for example, more bees are needed to cover a larger area, researchers say the bees will naturally train other hives. Sources: National Geographic News, Mine Action Information Center at James Madison University. Of the 19 U.S. Navy ships destroyed or damaged in conflicts since 1950, 14 were hit by enemy sea mines, which are detonated by the sound of large ships passing overhead. During the first Gulf War, Iraq blocked U.S. troops from landing by lining the Kuwait shore with mines. Two Navy ships—the USS Princeton and the USS Tripoli—were severely damaged and seven sailors injured by mines in the Persian Gulf. That is why the Navy’s Marine Mammal Program trains dolphins to locate and mark underwater mines. Using an ability called “echolocation,” dolphins emit a series of clicks that bounce off an object and return to the mammal, allowing it to construct a mental image of the object. When sent out searching by its handler, the dolphin will report back when it “ecolocates” a target object. The handler then sends the dolphin back to mark the location so ships can avoid it and divers can de activate it. Dolphins can detect mines tethered to the ocean bottom, sitting on it or even buried in sediment. And, particularly in murky or dark water, their biosonar is more powerful and accurate than any mechanical location device. Sources: U.S. Navy Marine Mammal Program, NPR, UPI, National Defense Magazine. 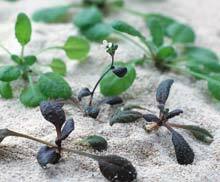 The thale cress plant is a member of the mustard family of small weeds. Its green leaves normally turn red in autumn or when the plant is subjected to stresses such as cold or drought. With some genetic engineering, though, Danish researchers from the firm Aresa Biodetection in Copenhagen believe this color change can be used as an indicator of land mine contamination. They chose natural mutants of the plant that do not turn red in response to natural stimuli and then re-engineered the mutant s’ genetic make up so that they turn red only when the roots come into contact with nitrogen dioxide (NO2 ) -- a compound that leaks out of buried land mines. In demining operations, the seeds could be sown over suspected minefields from an airplane, and the plants would sprout and grow to full maturity within six weeks. Critics say that relying on leaks of NO2 is an inherent flaw, as some mines are specially sealed. (Dogs, rats and honeybees also rely on smelling leaks in their mine detection duties.) In addition, NO2 sometimes naturally occurs in the soil, which raises the risk of false positives. Sources: BBC, The Christian Science Monitor, Time magazine. Using a strain of bacteria that responds to trinitrotoluene (TNT) and has been genetically engineered to fluoresce brightly in its presence, researchers from the Oak Ridge National Laboratory in Tennessee are developing a method for examining hundreds of acres of potentially contaminated land in just a few hours. The bacteria would be sprayed over the area in question, and then its fluorescent glow could be detected, either visually or electronically. From an airborne platform, observers could determine location and concentration. Because it provides the ability to track large areas of land and is relatively easy to grow and transport, the bacteria is potentially an especially efficient alternative detection system. However, it can only detect the presence of TNT; well-constructed munitions that have not had time to corrode might be undetectable, and false positives around water drainage proved to be a problem during testing. Source: Demining Research at the University of Western Australia. Because of the African giant pouched rats’ success as land mine detectors, Bart Weetjens and his team at APOPO have begun to apply the rats’ strong sense of smell to the worldwide tuberculosis problem. Much in the same way that dogs are used to detect early stages of cancer, the rats are being trained to smell traces of TB in human sputum, or phlegm, samples. Rats evaluate the samples far more efficiently than humans can with a microscope, completing in 10 minutes what it takes a skilled lab technician a day to finish. So far, the rats are still in preliminary testing phases; however, based on the rats’ land mine track record, Weetjens sees TB detection as a natural application of their talents. What makes the rats so responsive to this kind of training? Rats are very convenient to train. They work in a more mechanical way than dogs, for instance. Dogs are too smart; they play games with the trainer. A dog is rewarded with affection while a rat is rewarded with food, which is much more basic. For instance, when a dog indicates a mine, you’ll have to take it out of the field because it gets too enthusiastic. It gets very excited. A rat just comes for its food and then continues searching for more mines, because it wants more food. The rats are also very small in size, so you can carry a lot of them into the field. They are an indigenous species, so they are resistant to more tropical diseases. They’re relatively disposable in the sense that, if you lose the rat, it’s not as big a disaster as if you lose a dog, which is a huge investment of time and money. Also, rats can be interchanged among trainers because there is less bonding. They lived six to eight years in captivity, which gives us a good return on our initial training investment. And there is also the fact that the animals naturally bury their food stocks underground. So, when food is scarce, they find their buried stash using their [sense of] smell. So their natural behavior is already pretty close to land mine detection. The extensive Web site for Nature’s special three-part miniseries on animal intelligence includes special features on how animal brains work, whether animals have emotions and what is meant by animal consciousness. Stefan Lovgren of National Geographic News reports on the efforts of the Pine Street Foundation in San Anselmo, California, to use dogs in the early detection of cancer.